Neon Staxx is a colourful five reel and four row slot game, with 40 pre-set paylines and a theoretical return to player percentage of 96.90%. The game provides players with the chance to alter both the bet level and coin value applied to their spins and also offers special features including free spins, scatters, wild substitutions and an innovative ‘Superstaxx Feature’. Sure to attract many players thanks to its attractive imagery, Neon Staxx is an interesting and fun slot. Below you will find a comprehensive review of the game, which will cover its top jackpot offering, special symbols and features, paytable details and betting limits. 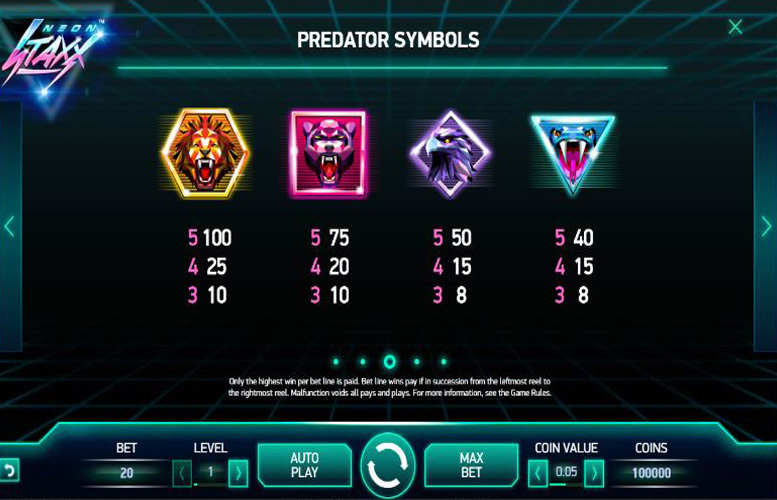 The Neon Staxx slot game has 40 pre-set paylines and the most valuable combination which can arise across a payline is one made up of five Wild symbols. That particular combination pays winnings worth 200 times the current bet level, meaning that at bet level ten the combination returns winnings of 2000 coins per payline. If the five Wilds combination comes up on all 40 paylines at once, therefore, that can result in the game’s top jackpot of 80,000 coins. At the highest possible coin value setting of 50p, that top jackpot would be worth a total of £40,000 to the lucky player who achieves it. Neon Staxx is actually quite a simple slot which only has two special symbols and one additional extra feature. Those symbols are the game’s Wild and Scatter symbols, and the additional feature is the so-called ‘Superstaxx Feature’. Wild Symbol – as mentioned above, the Wild symbol is actually the most valuable symbol in the game but also works in the same way as any traditional wild. That is by substituting for all other symbols except the Scatter symbol and going towards making up the most valuable possible combination for any payline in which it appears. 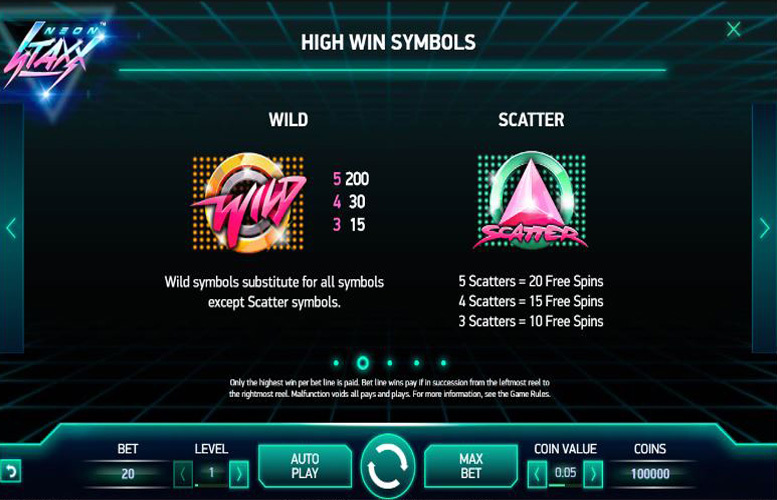 Scatter Symbol – the Scatter symbol found within the Neon Staxx slot is the symbol which is used to trigger the game’s free spins. Those free spins are activated if three or more Scatters appear on the game’s reels, with ten free spins being triggered if three appear, 15 if four come up and 20 if five are revealed by a spin. All free spins are played at the same bet level and coin value as the spin which activated them and additional free spins cannot be won. Aside from those two special symbols, the only other special feature of the game is its ‘Superstaxx Feature’. That feature means that a stack of symbols can appear on any of the five reels at random intervals, by way of adjacent positions on those reels being replaced by one random symbol from the paytable. 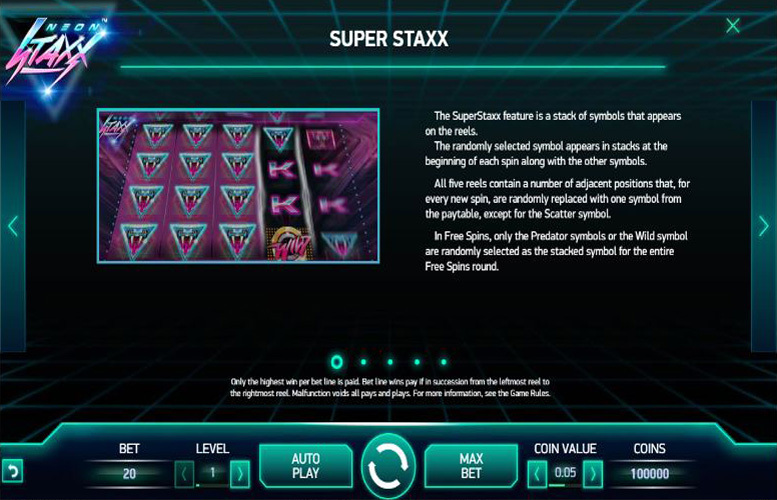 Those stacks appear at random at the beginning of each spin along with the other symbols and during free spins it is just the Predator and Wild symbols which can make up the stacks. Unusually, it is actually the Neon Staxx Wild symbol which is also the highest paying symbol on the game’s paytable. 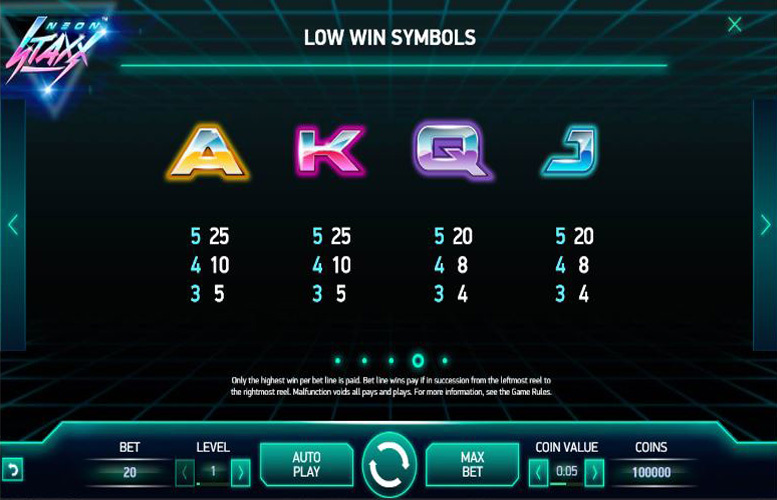 If five of those symbols line up along a payline, the player receives a payout equal to 200 times the bet level which at bet level ten can be worth 2000 coins. If that combination appears on all 40 paylines at once, therefore, the player receives the game’s top jackpot of 80,000 coins. 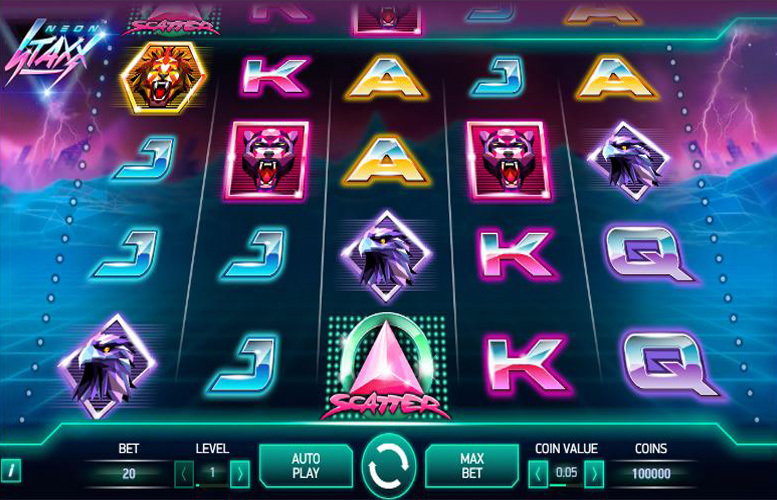 The next most valuable symbol in the slot – and therefore the most valuable normal symbol – is the neon lion symbol, which pays at a rate of 100 times the bet level for a five symbol combination. 40 of these combinations appearing at once and at bet level ten, therefore, can result in a jackpot of 40,000 coins. The Neon Staxx game gives players the choice of ten different bet levels from 1-10 and six coin value amounts from 1p to 50p. Bet level one represents a stake amount of 20 coins and each subsequent level adds another 20 coins to the wager. The minimum stake amount possible, therefore, is a total of 20p which is achieved at bet level one and a coin value of 1p. The maximum, meanwhile, is a total of £100 which is achieved at bet level ten (200 coins) and a coin value of 50p. Neon Staxx is a slot which offers players a fun and potentially rewarding gaming experience but which does not compare particularly favourable with many other games on the market. The slot is colourful and attractive but does not feature any particularly inspiring graphics, so cannot claim to be amongst the most visually exciting and stimulating options around. The gameplay, too, is pretty simplistic with just a ‘Superstaxx Feature’, wild substitutions and free spins as additional features. What’s more, those features are not entirely impressive, with the ‘Superstaxx Feature’ proving more than a little confusing and both the wild substitutions and free spins being devoid of any further elements or bonuses. When it comes to jackpots, too, what Neon Staxx offers is reasonable but not market leading. The top jackpot available per payline of just 2000 coins is comparatively low and with a top coin value of 50p, its currency equivalent of £1000 is also considerably less than payline jackpots offered by many other games. This game has a rating of 3 / 5 with 421 total reviews by the users.